At Integrity Air Conditioning & Heating, we are dedicated to providing you with an HVAC system that will work efficiently and effectively for your heating and cooling needs. We believe that there are six keys to successful HVAC installations, and that’s why, from helping you find the right high-efficiency air conditioner to improving the energy efficiency in your home with duct insulation, and keeping everything running with proper HVAC maintenance, our team has you covered. 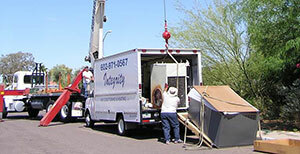 If you live in the greater Phoenix region and need heating or air conditioning services of any kind, give us a call today!